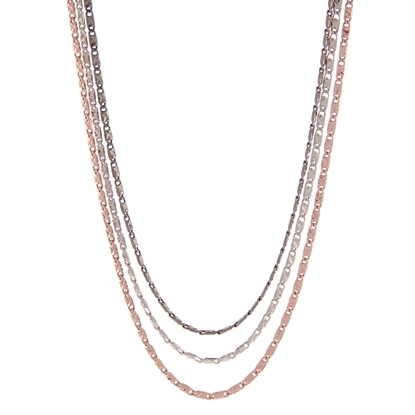 Bring on the bling and sparkle brilliantly when you wear our stunning "Glam Time" neckpiece! Boasting a gorgeous Swarovski crystal encrusted ball finished with luscious pearl detailing and a stunning abalone pendant. 28" chain plus 2" extension. Nickel and lead free jewellery. 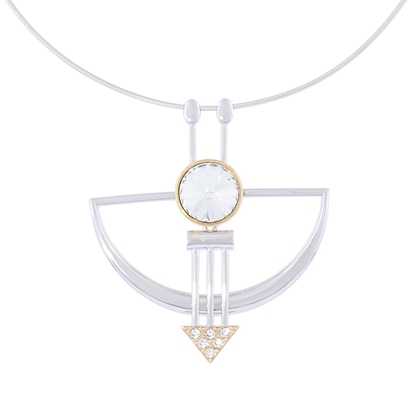 Add a "Glamorous Touch" to your fanciest party dress or to your simplest tee wearing this versatile neckpiece featuring a mix of fine filigree edging surrounded by white Swarovski crystal.18" NeckpieceNickel and lead free. 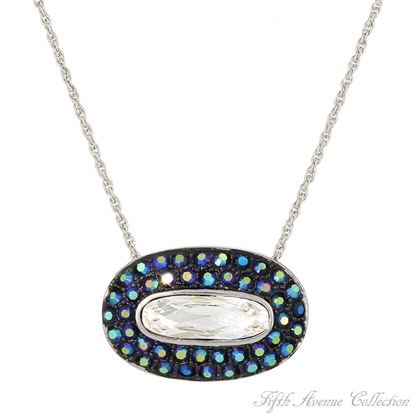 A blazing clear antique cut Swarovski crystal surrounded with two rows of sparkling jet blue aurora borealis creates a look that's all its own. 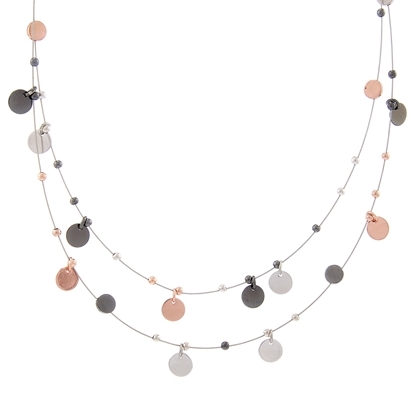 18" Neckpiece with 2" extension Nickel, lead and cadmium free. 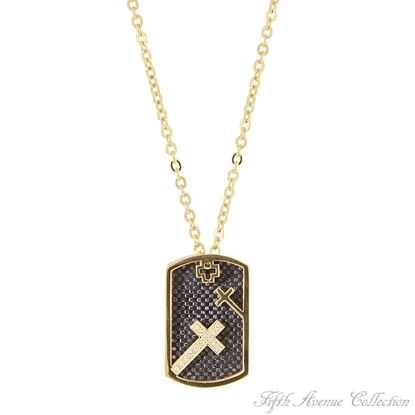 Get ready to make a statement with Fifth Avenue Collection’s “Gold Statement” neckpiece. Thirty inches of impeccable, fine, gold-finished curb-link chain sweeps down to a stylish, gold tassel pendant featuring a crystal embellished, octagonal bail highlighted with rhodium-finish. Casual, high-end glamour has never been so easy! Ladylike and pretty our “Gracious Beauty” neckpiece was designed to catch the eye. 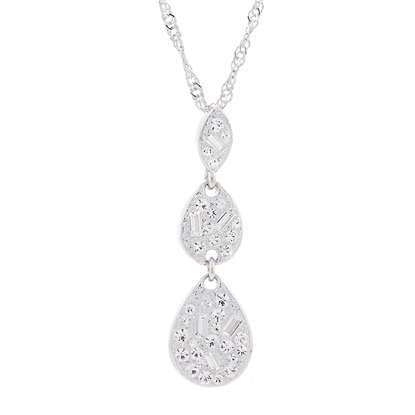 Adorned with stunning Swarovski crystal and diamond dust this piece is an example of fine detailing at its best! 24” designer chain with 2" extension. Nickel and lead free. 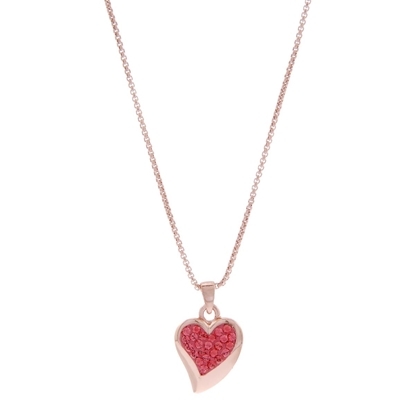 Feel the love when you wear our enchanting “Her Passion” neckpiece. The mixture of intricate details, including Swarovski crystal and the exquisite dancing cubic zirconia center, is truly unforgettable. 18" neckpiece with 2" extension. Lead and nickel free. 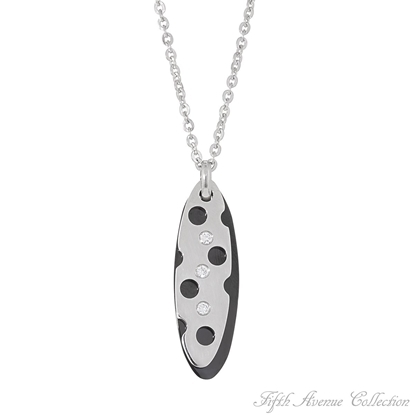 Oblong stainless steel studded with cubic zirconia is backed with a high polished black mate. 22" pendant Nickel and lead free. "Home Sweet Home" is the light at the end of a busy day. Fifth Avenue Collection has captured the feeling with this beautiful house key that sparkles with Swarovski's clear crystal. 27" neckpiece with 2" extension Nickel and lead free. 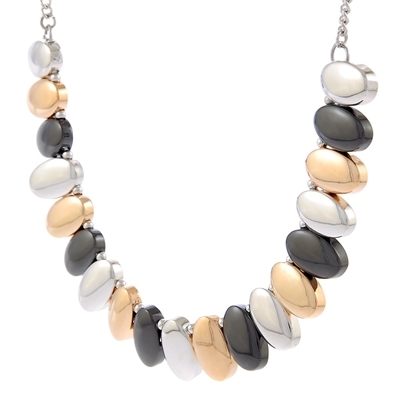 Bold in its design and details our two-tone "Hypnotic State" neckpiece is sure to keep everyone hypnotically distracted. 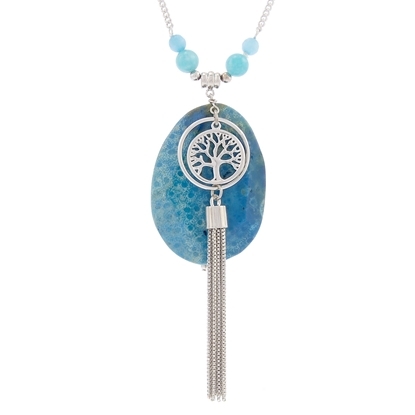 A 30" box chain entwined with a mesmerizing tassel create this stunning beauty Lead and nickel free. 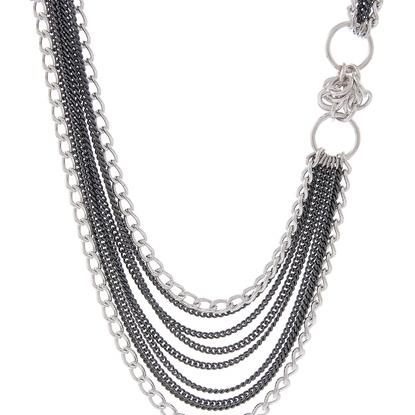 Our “Iconic Fringe” boasts dazzling layers of rich rhodium finished chain creating the perfect statement neckpiece. 18” designer chain with 2” extension. Nickel and lead free. 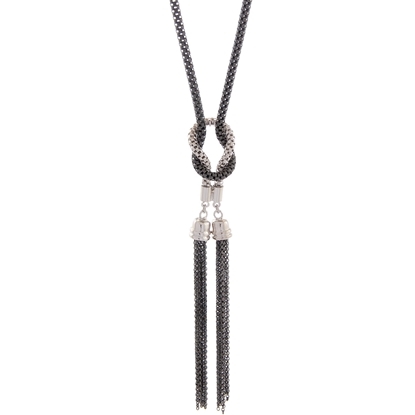 This playful neckpiece puts some fun into helping raise awareness for a serious men's health issue. 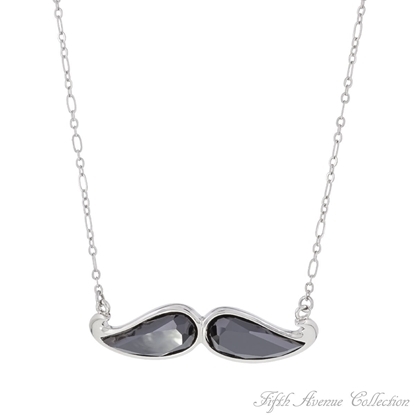 Suspended from a rhodium finished fine link chain, rich German Glass is faceted and decoratively curved into the shape of a moustache, bringing style and attention to this important cause. 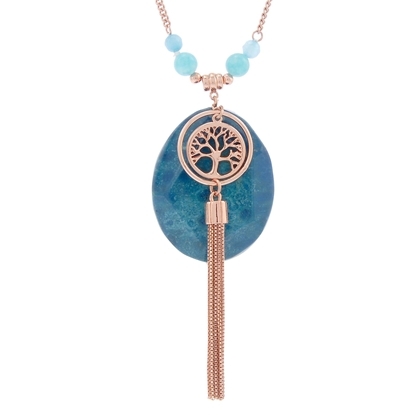 Wear your support by purchasing this neckpiece, as $3 from every purchase goes directly toward prostate cancer research. 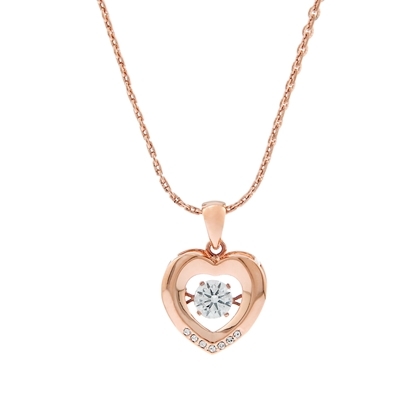 The ultimate statement piece our "In Control" neckpiece boasts a distinctive and stunning 3" oval pendant delicately lined with intricate designs and finished in rich rose gold. 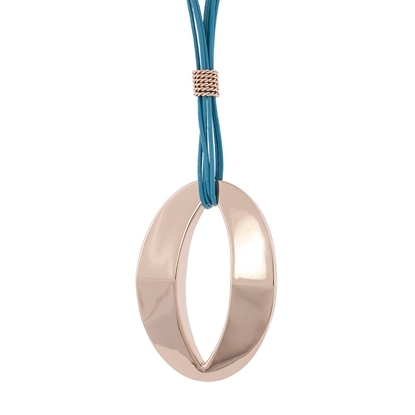 Featuring striking turquoise leather, this neckpiece will have heads turning. 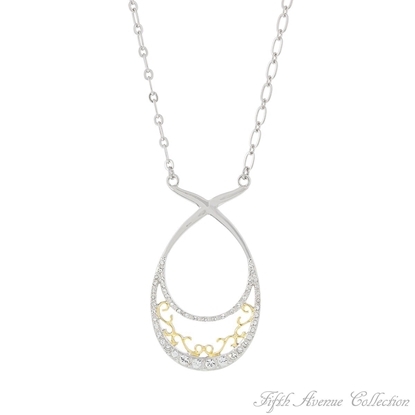 The ultimate statement piece our "In Control" neckpiece boasts a distinctive and stunning 3" oval pendant delicately lined with intricate designs and finished in rich and durable rhodium. 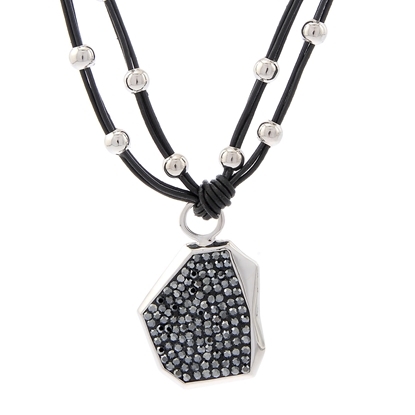 Featuring striking black leather, this neckpiece will have heads turning. Big, bold and full of confidence our “Irresistible Charm” rainbow quartz beaded neckpiece is most definitely eye catching. 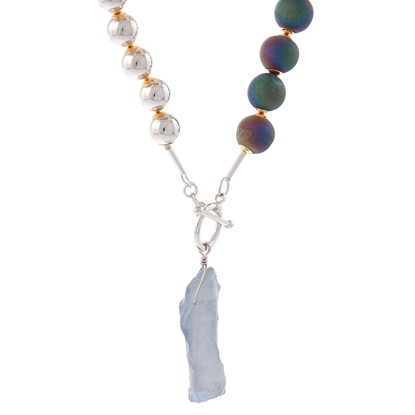 Boasting 41 unique rainbow quartz beads along with smooth rhodium beads, this stunning design is finished with a raw genuine quartz pendant to create bold beauty at its best. 28” neckpiece. Nickel and lead free. 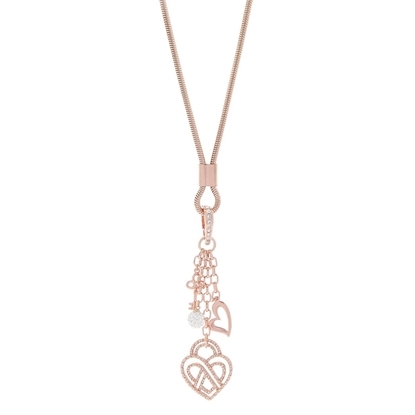 The latest Infinity Collection design by Fifth Avenue Collection is the stunning "Key To My Heart" neckpiece finished in popular rose gold. A dreamy combination of charms drops gently from a 26" snake chain adorned with a smooth bail sparkling with Swarovski clear crystals: a trendy key, a shimmering crystal ball, a smooth open heart, and a filigree heart studded with dozens of sparkling rounds. Get ready to flaunt your stuff Hollywood style with Fifth Avenue Collection’s “L.A. Strut” neckpiece. Strong, confident fashion designed for the who’s who and perfect for you to create your own red carpet entrance, this neckpiece features a sleek, 16-inch, rose gold-finished, solid wire neckpiece that boasts a unique, eye-catching designer pendant of smooth, polished bars. 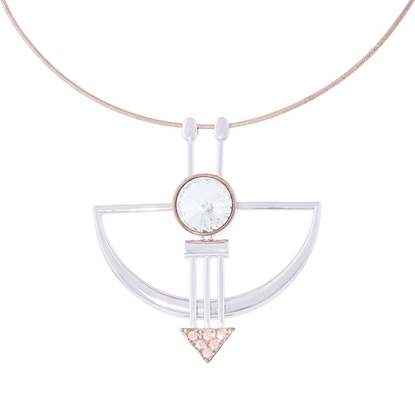 The pendant’s pi?ce de résistance is a stylized arrow with a two-tone centerpiece encasing an extravagant yet tasteful Swarovski crystal that drops to a pointed cluster of five peach crystal brilliants. 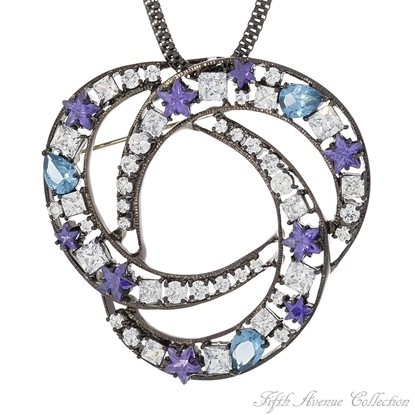 Assured, fearless, and guaranteed to get you noticed, this piece is high fashion at its best. Get ready to flaunt your stuff Hollywood style with Fifth Avenue Collection’s “L.A. Strut” neckpiece. Strong, confident fashion designed for the who’s who and perfect for you to create your own red carpet entrance, this neckpiece features a sleek, 16-inch, rhodium-finished, solid wire neckpiece that boasts a unique pendant of smooth, polished bars. The pi?ce de résistance is a stylized arrow with a two-tone centerpiece encasing an extravagant yet tasteful Swarovski crystal that drops to a pointed cluster of five brilliant rounds. Assured, fearless, and guaranteed to get you noticed, this piece is high fashion at its best. 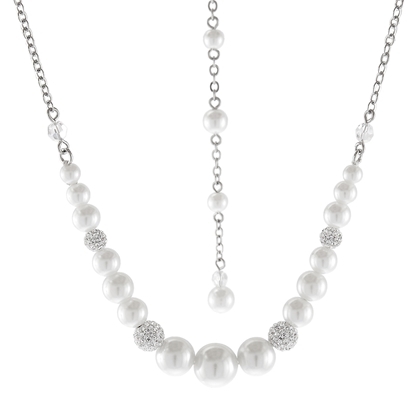 Add an instant touch of sophistication and highlighted elegance when you wear our “Ladies First” pearl neckpiece. This stunning design features dreamy variegated pearls, sparkling Swarovski crystal encrusted balls and a captivating pearl back drop. 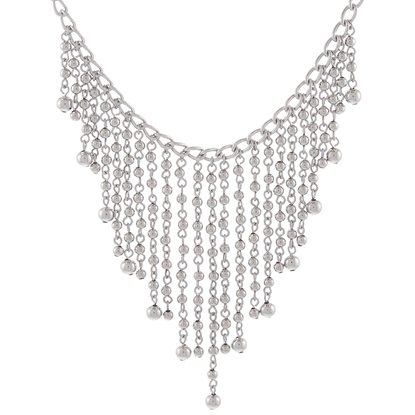 17" neckpiece finished in rich rhodium. Nickel and lead free.